Welcome to March. Our time in Kauai runs thin. . .
Detoured to the beach on the way to meet some of Ian's teammates for dinner last week. We were early, and my Monday had been a Monday and Tuesday all rolled together. Spending time with the ocean is therapy for crazy days. (How do people who live in Kansas manage??) We waded into the surf a short ways before being distracted by a dark shape in the waves breaking on the reef edge. 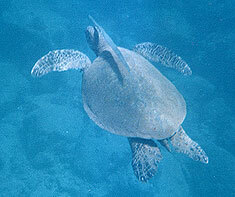 Patience revealed the shape to be two sea turtles swimming close to shore, surfing down the backwash, finding dinner in the sea-salad growing on the reef edge. We watched them through the water, which sometimes became so shallow that shells and flippers broke the surface. The turtles mostly ignored the humans; the humans stared, slackjawed and grinning like idiots. We were late to dinner.